Alfalfa is a major profit center on most dairy farms. The annual yield for alfalfa has the largest impact on its profitability. As the stand ages, the yield declines due to environmental stresses, wheel traffic, and diseases. Since alfalfa yield declines with advancing age, producers should consider turning over stands faster to stay in a high yield range. This paper examined the factors that affect the economics of production and the profit from producing corn silage and alfalfa in rotations of various years. The analysis was prepared using the Agriculture Budget Calculation Software (ABCS). This program allows the user to enter the tasks involved in the production recipe along with the inputs required by each task. For example, the corn-planting task requires the inputs of corn seed and starter fertilizer. The ABCS program calculated the costs associated with using tractors and implements. The costs calculated are: energy, labor, repairs, ownership interest cost, and a depreciation charge. The number of acres a task was performed on in a year can cause the per acre costs to vary. The analysis created seven enterprise budgets including: an alfalfa establishment budget, an alfalfa hay budget for the first year following establishment, an alfalfa hay budget for the second year following establishment, an alfalfa hay budget for the third year following establishment, an alfalfa hay budget for the fourth year following establishment, a corn silage budget for the year following the plowdown of the alfalfa, and a corn silage budget for the corn after corn year(s). Alfalfa yield was reduced 0.46 tons of dry matter yield each subsequent year following the first year after establishment. Corn silage yield was 17 percent higher in the year following the plowdown than in the corn after corn year(s). The ABCS program has a feature that calculates whole farm incomes and costs based on enterprise budgets. This feature requires the selection of a fixed acreage for comparison among rotations. The acreage selected was 328 crop acres which is the average acres for the highest percent group of dairy farms in Wisconsin. The manure (2632 tons) from a 65-cow dairy herd and replacements was accounted. The equipment complement selected had a new value of $780,274 with $530,333 cost basis value remaining. Six rotations, whole farm budgets, were studied within the 328 acre constraint. The rotation shorthand used the notation of “E” for the alfalfa establishment year, “A” for the alfalfa hay year(s), and “C” for the corn silage year(s). The rotations selected were: EAAAACCC, EAAAACC, EAAACC, EAACC, EAAC, and EAC or 8-, 7-, 6-, 5-, 4-, and 3-year rotations. The acres were divided equally between the years in each rotation. For example, the eight-year rotation (EAAAACCC ) would have 41 acres for each year of the rotation. There would be 41 acres for the establishment year, 164 acres for the four years of alfalfa, and 123 acres for the three years of corn silage. 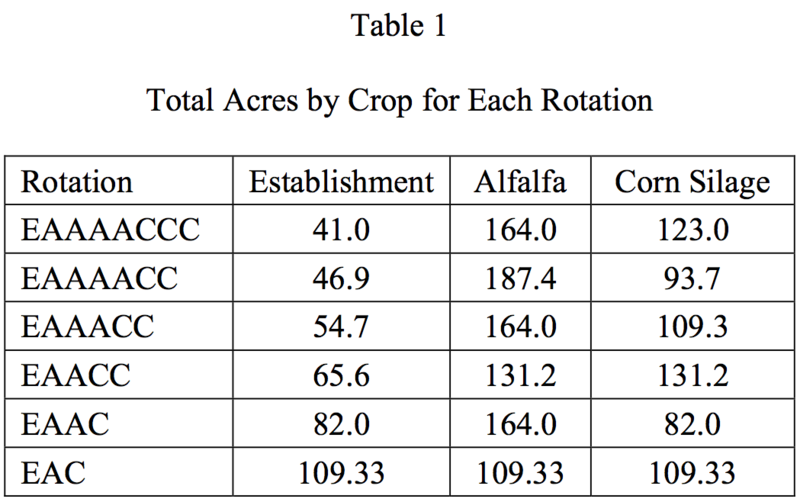 Table 1 gives the total acres by crop for each rotation. The base prices were: oatlage, $52.00/ton of dry matter (tdm); corn silage, $53.74/tdm; hay, $114.94/tdm; and haylage, $114.94/tdm. The base yields were: establishment crop, 2.0 tdm per acre oatlage and 1.0 tdm haylage per acre; hay crop, 3.87 tdm per acre (decreasing 0.46 tdm per acre each year as the stand aged); and corn crop, 6.3 tdm per acre (17 percent larger in the year following plowdown). credited at 3 pounds of nitrogen per ton, 3 pounds of P2O5 per ton, and 7 pounds of K2O per ton. The second year credit for manure was 1 pound of nitrogen per ton, 1 pound of P2O5 per ton, and 1 pound of K2O per ton. 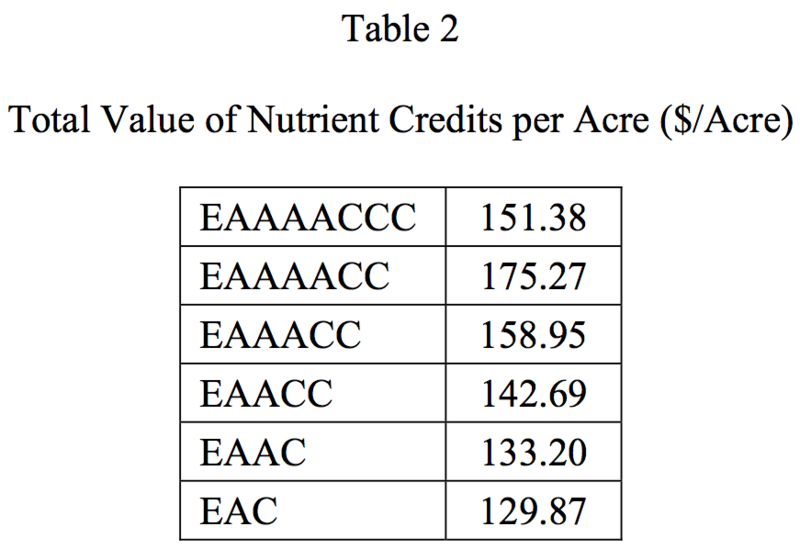 Refer to Table 2 for the total value per acre for nutrient credits for the alfalfa and manure. Refer to Table 3 for the amount of manure applied per corn silage acre and the total corn silage acres. Nutrient credits were based on $0.36 per pound nitrogen, $0.35 per pound P2O5, and $0.21 per pound K2O. 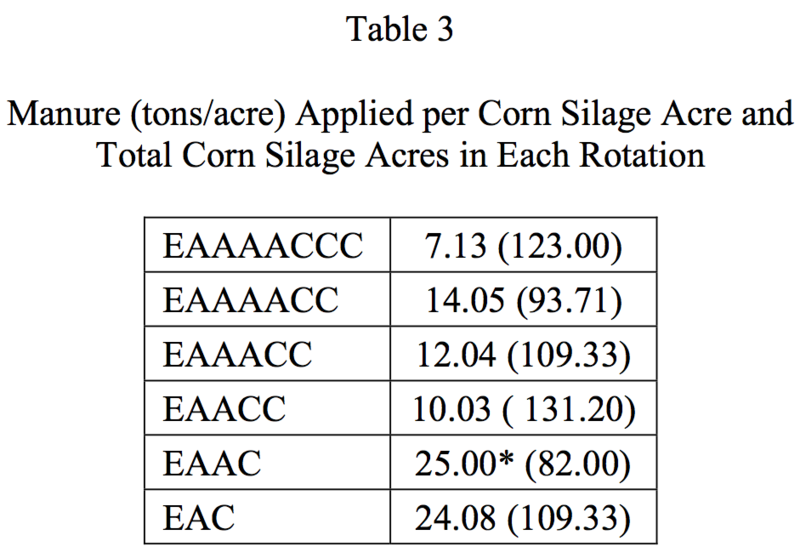 For the EAAC rotation, the acres in corn silage should have 32.1 tons of manure applied per acre. The recommended maximum application rate under University of Wisconsin recommendations is 25 tons per acre. If the total amount of manure available was applied, profit per acre increased by $8.33 per acre for this rotation. A producer may require more than the highest profit per acre from a rotation. A producer may want a certain mix of production in order to feed their dairy herd. Table 4 shows the production in tons dry matter (tdm) that would be produced on the 328 acres with the various rotations. The highest profit rotation (EAAC) produced 164 tdm oatlage, 82 tdm haylage, 597 tdm hay, and 604.3 tdm corn silage. The 4-year rotation of EAAC was the most profitable (Table 5). The 8-year rotation of EAAAACCC was the least profitable, followed by the 3-year rotation of EAC. The 7-year rotation of EAAAACC and the 6-year rotation of EAAACC had very similar profits. 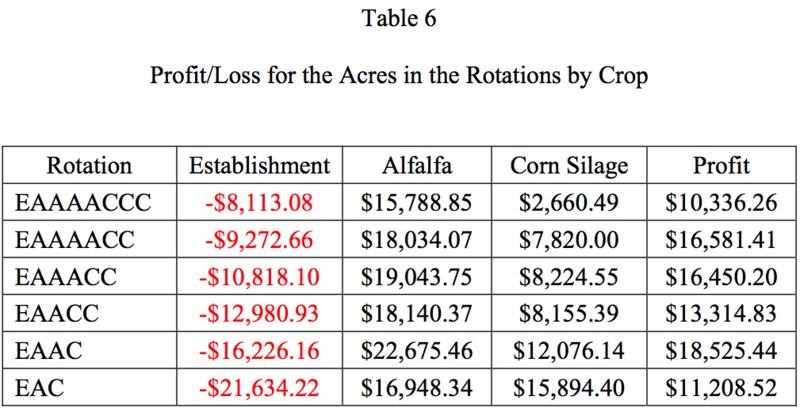 A closer examination of the total value of nutrient credits (Table 2) and the profit/loss for the acres in the rotations by crop (Table 6) helps to explain the results. Each acre of alfalfa established loses about $200. Examining the costs involved with establishing the alfalfa shows why this loss occurs. The total operating costs (inputs, energy, repair and maintenance, and input interest) were $263.07 per acre. The fixed costs (management charge, property taxes, operator labor charge, interest and insurance expenses, and depreciation expenses) were $153.75 per acre. The total costs were $416.82 per acre compared to the $218.94 value for the haylage and oatlage produced. Thus, the fewer years alfalfa is in the rotation, the more acres are required for establishment, the greater the dollar loss in the rotation. If a direct seeding of alfalfa was used, however, then the loss per acre would have been reduced to $0.73 per acre and the profitability of all the rotations in the study would have been increased significantly. The direct and fixed costs were similar to the oat-alfalfa establishment, but the value of the harvested alfalfa (3.5 tdm/acre) was much higher ($402.29). The EAAC rotation (most profitable) has the highest profit for alfalfa and the second highest profit for corn silage. It has the second highest loss for alfalfa establishment. It has the second lowest total value of nutrient credits. The EAAAACC rotation (second most profitable) has the fourth highest profit for alfalfa and the fifth highest profit for corn silage. However, it has the second lowest loss for alfalfa establishment. It also has the highest total value of nutrient credits. The EAAACC rotation (third most profitable) has the second highest profit for alfalfa and the third highest profit for corn silage. It has the third lowest loss for alfalfa establishment. It also has the second highest total value of nutrient credits. The EAAAACCC rotation (least profitable) has the lowest profits for alfalfa and corn silage, but the least loss for alfalfa establishment. It also has the third highest total value of nutrient credits. The return on assets for the most profitable (EAAC) rotation was 2.56 percent when both land and equipment was valued at their highest cost (see Table 6). Reducing the value of the equipment to its cost basis value increased the return on assets to 2.99 percent with land at its fair market value. Entering land into the formula at its cost basis value yields a return on assets of 4.80 percent. This last method of calculating the return on assets is the method used by non-farm businesses. Some individuals do not include land in the calculation of return to assets, because the income from the long run average increasing value of land was not included in the profits from this enterprise. The results of this method are shown in column 4 on Tables 6 and 7. The return on assets (new price and fair market value) was 2.05 percent for the least profitable rotation (EAAAACCC) when both land and equipment was valued at their highest cost. When calculated as relative measure, the return to assets for the most profitable rotation was over 25 percent higher that the return to assets in the least profitable rotation. The absolute change in return on assets was 0.51 percent (2.56 – 2.05). However, even these small absolute differences compound to large differences in net worth over the lifetime of a producer. Profit is determined by the price times the yield minus the cost of production. 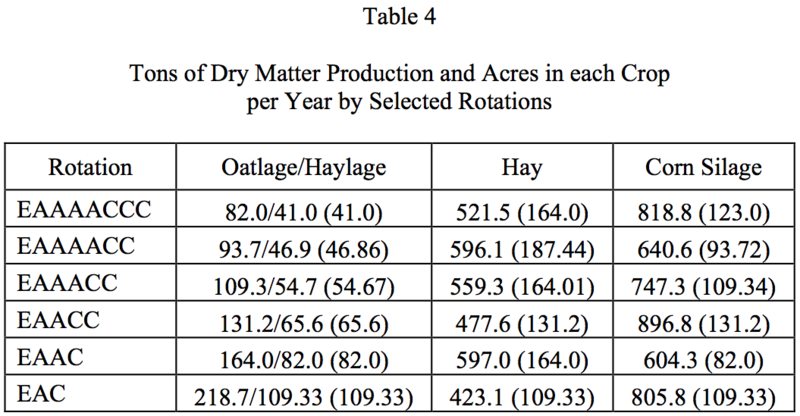 Table 8 summarizes how sensitive the profit per acre was to the starting hay yield in tdm/A and the rate of hay yield decline per year in tdm/A. 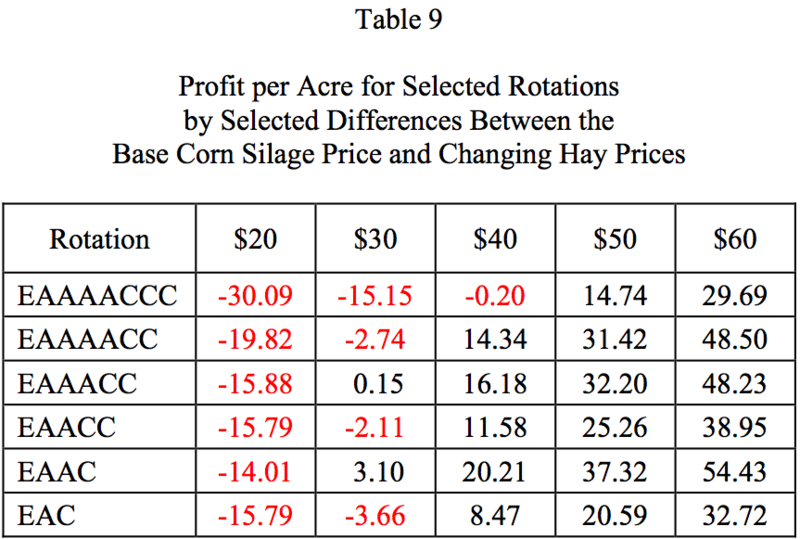 Table 9 summarizes how sensitive the profit per acre was to difference between the prices of corn silage and hay. The base price of corn silage was $53.74/tdm. For example, for the $20 price difference between the base corn silage price and the hay price, the price for corn silage would be $53.74/tdm and the hay price would be $73.74/tdm. hay yield and rate of decline in the base hay yield as the stand aged. The 4-year rotation was the most profitable for all of the price differences, between corn silage and hay, considered. The amount of profit per acre for all rotations increased substantially as the price difference between corn silage and hay increased. Maximizing short run economic profit could cause environmental problems. This study looked at economic effects only. This study did not look at the environmental problems (erosion, soil compaction, water quality, etc.) that may or may not be caused by the selected rotations. More years of alfalfa would likely cause fewer environmental problems than more years of corn.